It’s been a whole year since we finished our kitchen renovation (how!?) so we thought it would be fun to share how it looks today (not all that different) and how it has been wearing, as well as, some additions we’ve made and things we’re thinking about changing or would do differently. There have only been a few additions since completing the kitchen a year ago, and maybe that’s a good sign. We added hanging herb planters a few weeks ago that instantly added life to the kitchen. We also ended up buying a second over-the-counter cutting board from Ikea. Initially we bought it to replace our current one for when it was worn, but we ended up putting it on the other side of the ranges and it just stayed there. It’s so convenient to have a couple chopping stations “built in” and they are only around $10 each. Lastly, we added a plug to the island, which if you listened to this week’s podcast, you know all about that. 2. How’s _______ holding up? The Ikea cabinets, which we probably get asked about the most, still look and feel brand new. We are still crazy about the warm black Laxarby finish and would choose them again in a heartbeat. On the other hand, the island legs and baseboard (that we partially customized and painted ourselves) are riddled with chipped paint. It does take a lot of abuse from counter stools and kicking feet, and all it would take to fix it is some extra paint, but I’m still trying to figure out if there’s a better solution than the primer and paint we used initially. Probably not? And I’m curious if this is just going to be a yearly tradition of touching up our island. 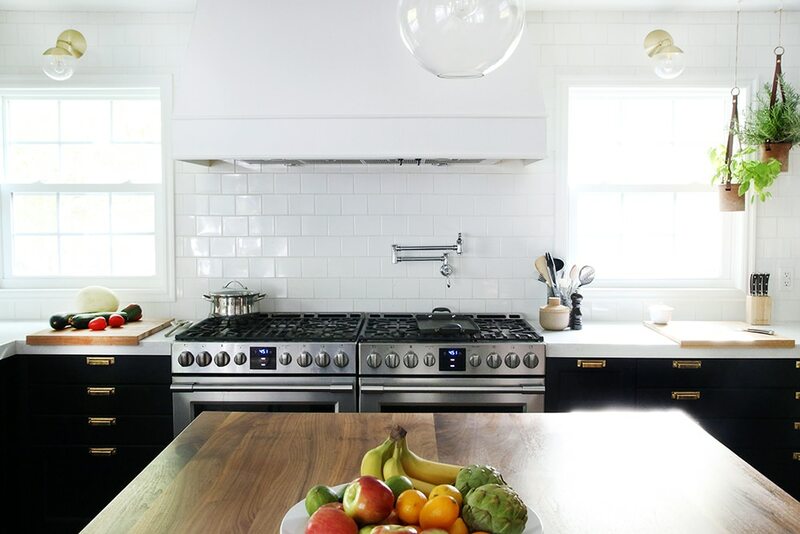 The Frigidaire Professional appliances we absolutely love and have had no issues with. There was a times shortly after we had them installed that I was having trouble opening the freezer–the suction was so tight! But I learned that is actually not a problem, but a good thing. Some industrial and high grade refrigerators or freezers have a small vacuum pump to draw out the warm air from the chamber after the door is opened, to improve efficiency. So, we have a very efficient freezer. Do we use the double ovens all the time? Not as much as all those cooktops, which we seem to fill up almost completely at least once a week. I’ve loved hearing and seeing all of you that have put two ranges side by side this year. Keep ’em coming. 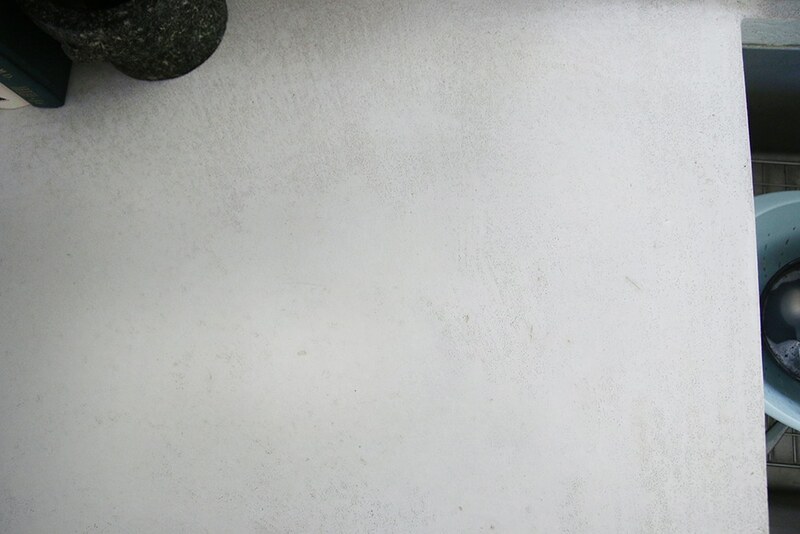 The white concrete countertops are doing relatively well, but they do need resealed. There are a few spots (by the sink mostly) where the sealer has cracked or chipped in small places where it is susceptible to stains if we don’t get it resealed soon. The unlaquered brass hardware is still really shiny and new-looking and we’re enjoying it, but also looking forward to the beginning signs of patina. 3. Would we change anything? We’ve started talking about possibly adding in glass-front upper cabinets in place of, or in addition to, some of the open shelving. We’re both currently very happy with the open shelving and while Chris is pretty firm on the idea of keeping it forever and always, I’m more torn because while we love the ease of the open shelves and have enjoyed them so much. We just have so many glasses and dishware that makes more sense in cabinets than drawers in my mind. The upper cabinet above the microwave is filled with dishes and stemware and the drawer to the left of the dishwasher is, too. The kitchen was designed for open shelving or upper cabinets to work, so time will tell if anything changes there. One other thing that we’re 95% sure we’re ready to change is the sliding barn door in the dining room (which I forgot to take an updated picture of so I hope you can accept the one below taken a month ago). 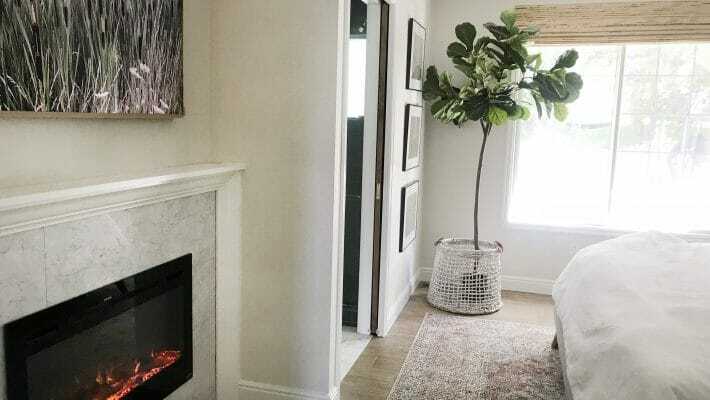 We added that before renovating or even finalizing our kitchen plans, and since installing the pocket pantry door, it seems to make the most sense to put an identical mirrored pocket door leading into the laundry room. That would also give us the opportunity to put something fun on the dining room wall that only 2/3 used by the barn door right now. So that basically sums up how we’re still over-the-moon in our new kitchen one year later. I was fully expecting the honeymoon stage to be over by now, but we’re still going strong over here. If I missed something you’re curious about, I’m happy to answer it in the comment below. You can find all the sources here. See into the walk-in pantry (where our freezer is) here, the original kitchen reveal here, and a recent video tour of the whole house here. I would love to know if you have resealed your concrete countertop and if so how did you take your sealer off. Thank you. Working on a post for this this month! Stay tuned. Hi! Love your beautiful kitchen. Would you mind sharing the source of your range hood? We wrapped an Electrolux hood with a custom, wood cover. Unfortunately our hood is no longer made but if you wrap it then any hood that has enough blower power for your range should be great. Love your counters and we are strongly considering using the same system/materials to do our island. I see that you said they needed to be resealed because the epoxy was chipping in places. Did you ever get around to doing that? If so, did you need to sand off the original and reapply, or were you able to just apply another coat directly over the original? I’ve heard many horror stories about staining and etching in concrete counters but it seems that using the right sealer/coating is the key to keeping them nice. I only worry because the island is large and houses our sink and dishwasher, so lots of water dripping there, otherwise I’d do wood instead. Thanks for any info on the resealing and apologies if it’s in the blog. I’ve been searching and haven’t come across it yet. I just dropped four plates on my counters last night and chipped the edge of my counters ever so slightly. 😩 anyway are you guys going to reseal with the same product you initially sealed with? Just trying to fix my situation and would love your advice. It’s on our list for this fall! Hi Guys! 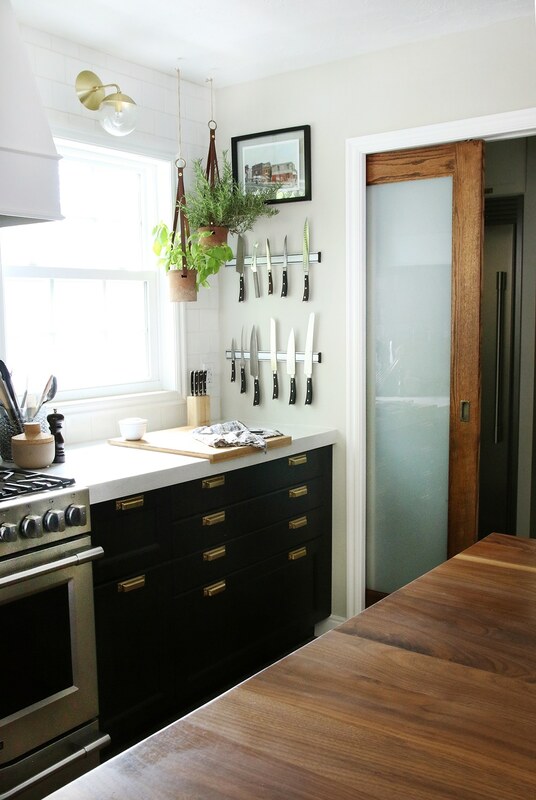 Are your kitchen cabinets all Ikea or did you do anything custom like door fronts to them? Thank you! Your whole house is beautiful. I’m a new follower and we just bought a fixer upper so I’ve found a ton of your posts to be super helpful! We had them custom cut out of reclaimed boards from a lumber yard around here. I know you guys sited your hood cover, do you have steps on how to make it? I couldn’t find it on your site. We’re currently in the process of wrapping our kitchen reno and I came across yours..fell in love! I can’t find anywhere what vent hood you used in this installation. Could you share? CFM? Size? We used a 48″ electrolux hood and built a 60″ cover around it. We’re looking to put two very similar ranges side-by-side, and I have a technical question. We’ve been told that a 3/4in gas line isn’t large enough to supply two 30in ranges. However, we’re told that it is enough for a 60″ range with two ovens and the same number of burners. My question is: can you share the installation process, specifically how you addressed supplying each range with gas? We had an Hvac guy run a gas line and then split it for the two ranges. Sounds simple enough. Any issues at all with running a lot of burners and both ovens at the same time? Any chance you know the side of the gas line? Standard seems to be 3/4in. Thank you again! We are completely sold on your fridigaire appliances and need to purchase them this week for our new home. I know you mentioned that others had done the double range in their kitchen but I can’t find any online. Is there any chance you could share some of their pictures? We put two of their 30″ ranges side by side in our kitchen. I’m new here and having so much fun perusing; everything I’ve seen has turned out gorgeous! Your kitchen is so aesthetically pleasing while being functional and flowing with the rest of your gorgeous home♥ With regards to the open shelving–I just wonder if you wouldn’t find a change in the shelves themselves–something a bit heavier in feel with reclaimed wood much like your den/reading room floating shelves and stained the same so they show more on the light wall and tie back to the butcher counter and sliding wood doors? Hi, Julia! First of all, I love your kitchen and it served as an inspiration to me as we designed our own kitchen in January 2016 (we live in a Brooklyn, NY apartment, so ours is on a smaller scale). I stumbled upon your blog while researching our Laxarby cabinets and the Frigidaire professional line. I’m wondering if you have any tips on keeping the Laxarby cabinets looking spiffy. as I struggle sometimes to keep them clean without leaving any lint residue, but I’m sure I’m missing something obvious. Thanks! We just wipe them down occasionally. We love the idea of the full fridge and full freezer, but what do you do for filtered water and ice? Thanks! Hi! love your kitchen. 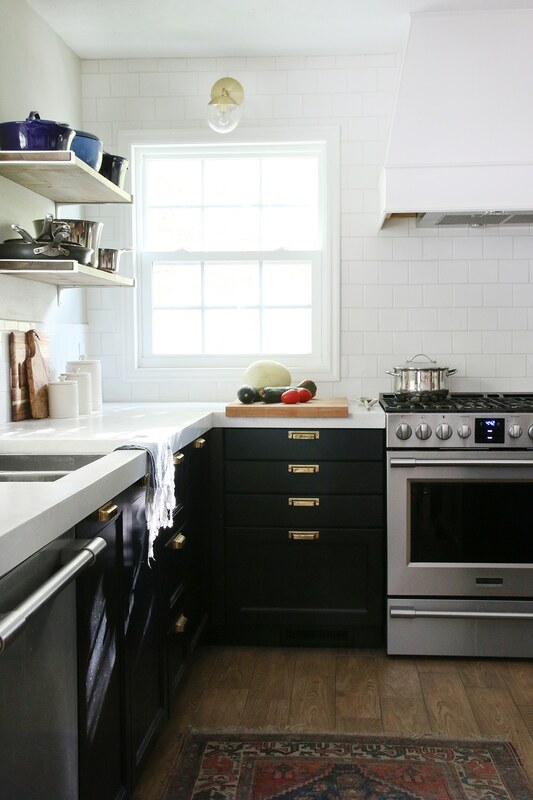 Wondering if you did a DIY how to for the range hood. i’ve been searching your site and can’t find one. or did you follow someone else’s? thank you! Love your kitchen! A few questions: What made you choose tile instead of wood? Does it make clicking sounds when you walk? We have been back and forth for months about our wood floors and I need to commit this month to one, it is stressful! Did you need to reinforce your walls in any way to make sure the open shelves could support the weight of pots/dutch ovens? You gave me the confidence to go with dark cabinets, so thank you!! Just a thought about the chipping: we painted our cabinets at the beginning of the summer and used four, YES four coats of Poly overtop to prevent chipping. This Poly was designed for the specific type of paint we used, but I’m sure you could find something to work with what you have used on your island. Our cabinets have stood up well so far to the abuse of three young kids and the Ikea bekvam being smashed around. 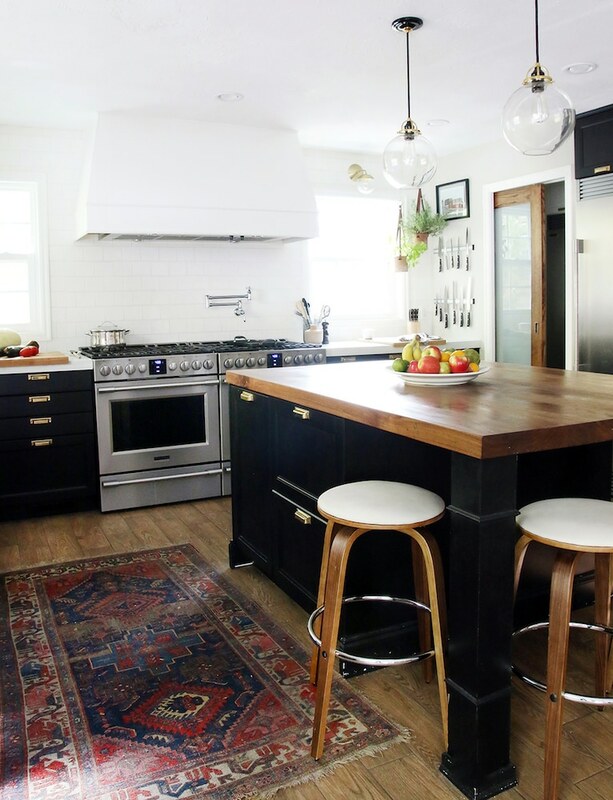 Gorgeous kitchen overall, love the rug and the black cabinets. This is interesting!! I told you before we are working on a cljkitchen lookalike. When we did some dry wall work we discovered we had to leave our soffet due to a pipe. So now I am doing the glass front Ikea cabinets as uppers under the soffet. Our range hood is white so I’m trying to decide if we would do the white glass cabinets or the lax option. I think I’m leaning towards the white. Have y’all thought about what upper choice you would pick? 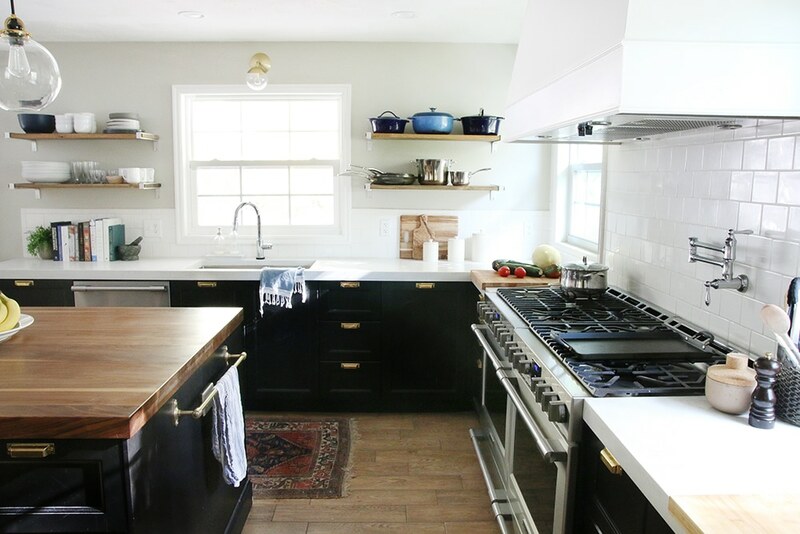 We would likely do black to tie into the black cabinets we have surrounding the fridge. 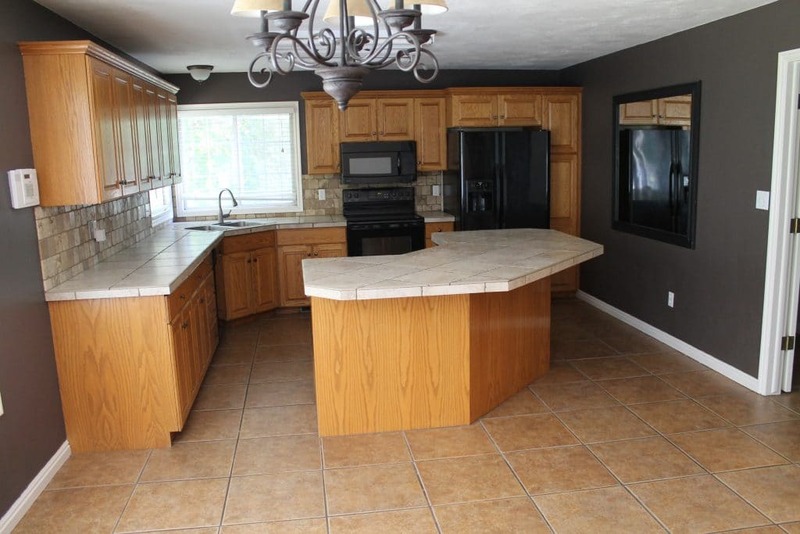 What is the approximate dimensions of this kitchen and same for your pantry? Do you have that listed in a previous post somewhere? This might be a totally bad idea, but what about using a clear nail polish to fill chips in your concrete countertops? Seems like it would “seal” the chip so it wouldn’t absorb a stain, and would sand off when you decided to refinish/reseal them. It’s good to hear your countertops of holding up relatively well over time. They seem to be the best least expensive option for a stone-feeling countertop. If you could, would you go back and splurge for stone? Not at this point. In the back of our minds that was always an optional back-up plan if they didn’t work but we truly love them. Love your kitchen! What do you use to care for your hardware? Did you put then on as is or any treatment to them before install? We just wipe them down with a microfiber cloth occasionally. They’ll patina over time. I think whenever anyone sees an open shelf kitchen they think it looks great but there’s always a question about storage. Your open shelves look fantastic, so personally, I would be hesitate to mess with it. Do you have the floor-space against one of the walls in the great room to have a free-standing, cabinet with glass paneled doors? Sometimes there are bookcases like this. You have such a beautiful kitchen! 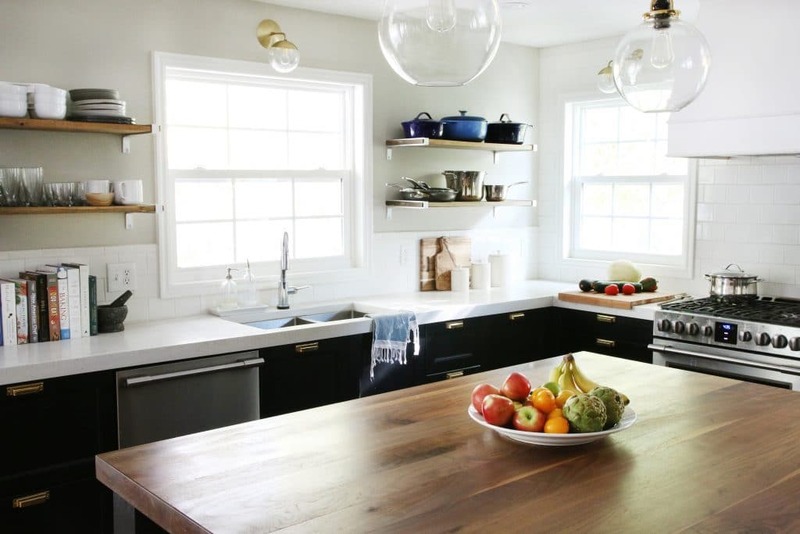 Have you considered finding a new spot to store the pots and pans currently on the open shelving and then using them for additional plates and glassware. I would worry about such heavy pots being stored up high especially when your daughters get bigger and eventually both take them down and put them away. Just a thought. Hi! I’m wondering how dirty your glass pendant lights get. I’m thinking of buying glass pendants for over my island (and possibly over my windows too) but I am hesitant if I will have to clean them all the time – do yours get/look dirty? Thanks! They get a little frosted looking every now again. I wash them every 3 months or so and it only takes a couple minutes. Do you have any dishware or glassware you could donate and that way you wouldn’t have to change your shelving/cabinets? Thanks for the update! We are drawing up the plans for our first remodel now so I appreciate the follow-up on your choices! 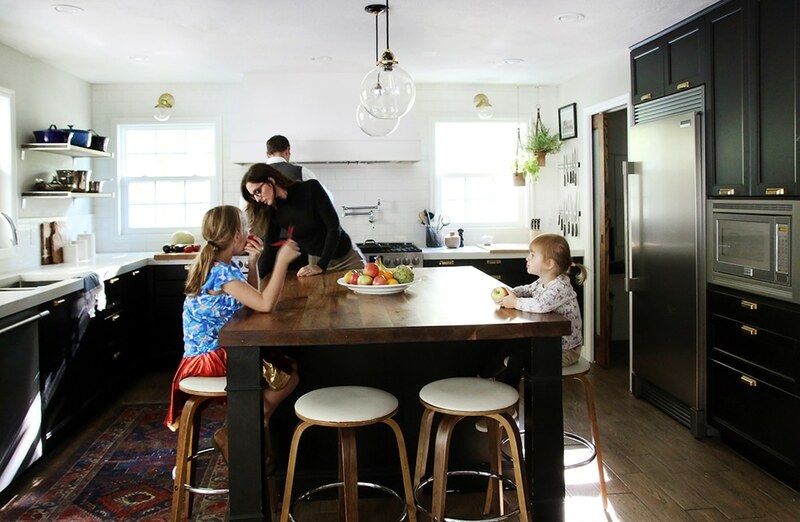 Still love this renovation (it’s what brought me to this blog:). Favorite parts: adding the new window, such great light! ; sinking the fridge/ cabinets into the pantry to add square footage; and gorgeous design :). The whole thing is brilliant! Outlets in islands are code required in Mass, so we have to do that. 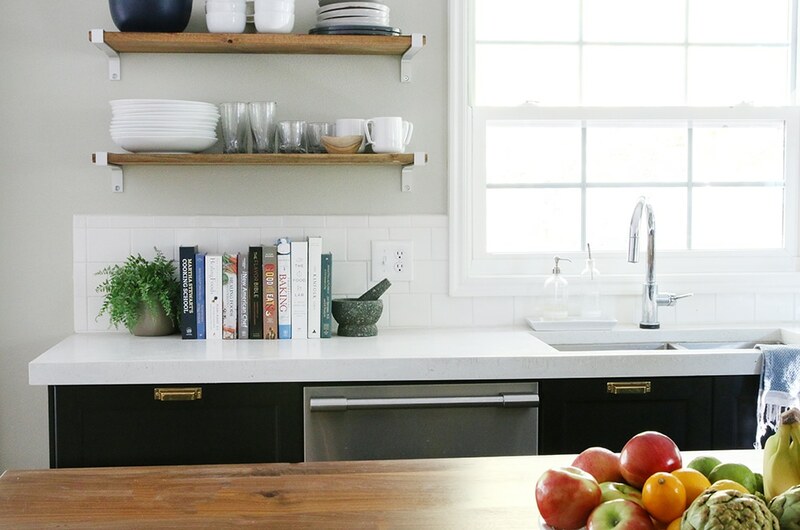 I still love this kitchen so much and although I could haven’t my plates on open shelves like this and would want them in cabinets, I LOVE the look in your home! Hi Julia, love your kitchen! I was wondering how you like the butcher block counter top on the island and if it is holding up nicely. 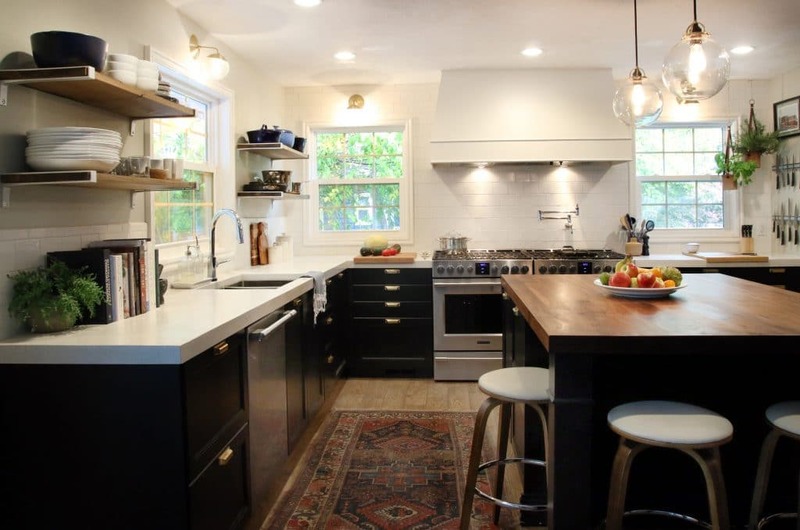 I loooove wood counter tops but I am wondering about the durability/ease. Thank you! Hi Julia, I love your style! I too am wondering how the wood island top is holding up? How much food prep use does it get? How often have you needed to reseal? An oil-based primer and paint might hold up better in those hard-working spaces. Oil-based is a pain to work with, but the durability is unsurpassed. Hi Julia! How are your bar stools holding up? My husband and I are thinking about buying them soon, but I’d love to hear how you think they are holding up. They are holding up awesome! The seats are a creamy white leather so they are really wipeable and the base is nice and heavy so they don’t tip! Love them! Hi Julia! We actually have the exact same hardware you do (we got it after seeing your beautiful kitchen!) and wanted to find out from you how you keep them clean?? You mentioned you’ve done nothing to them but ours get really spotty (presumably from water etc), especially the ones near the stove and sink. We’ve used Brasso on them but they are a pain to polish! How are yours holding up so wonderfully?? Occasionally I wipe them down with water and dry/buff with a microfiber cloth, but that is really it. Wiping unlacquered brass with a wet rag/sponge while you’re wiping down the counters (and not drying immediately) is probably the cause of the water spots. I have some original unlacquered brass in my house (1920s) and I’d actually recommend cleaning it LESS. You chose unlaquered because you want it to patina (presumably) and that will only happen if you stop polishing it. Occasionally wiping it with a microfiber cloth can help even out the obvious fingerprint or big dark splotch but otherwise leave it alone. If you want shiny brass you can replace your hardware with lacquered or be ready for super high maintenance kitchen cleaning. Thank you Ryan. Its our first time with unlacquered brass so this information definitely helps. I love the patina but its those dark splotches that bother me. But I’ll give it a whirl with the microfiber cloth! Beautiful kitchen! I am curious of the square footage? I like seeing these kind of post ! Because if everything is pretty, sometimes there’s things not so much practical that make living in the room harder. And I’m glad your counter kinda survived good ! I’m contemplating doing this kind of counter for a bar we plan to build in our basement. It’ll be less used than in the kitchen, and any crack/stain won’t as much there I think ! I’m wondering how cabinets would work next to the window on the stove side? Our open shelves are upper cabinet depth, so it would look similarly. However, we would sure miss the breeze and ease of open shelves. We’ll likely think on it a while longer before making any moves. I would love to know the source for the brackets you used on the open shelving! Still one of my very favorite kitchens of all time. In regards to your island, we put 3 or 4 thin coats of Polycrylic on ours (after painting it black), and a year later, there’s not a scratch in sight! That’s with two crazy Pitties jumping on them and feet kicking it, etc. Give that a go, maybe? I don’t know why I didn’t think of that. Great idea! Where is the open shelving from? I would love to get some for my kitchen. I looked at the source list, but didn’t see them. Thank you for the help! You can read all about those here. Shelves are reclaimed wood and brackets are from Blue Stone Shelving. What are your thoughts on window treatments? It doesn’t look like you have any or any blinds. Maybe those windows aren’t visible for anyone outside, but I would think you could see straight in at night. I’m curious about this too! I have a similar window in my kitchen and privacy isn’t an issue for us. Unfortunately, the problem is that when the sun is setting, it shines blindly at eye level. It makes being in the kitchen less enjoyable in the evening. 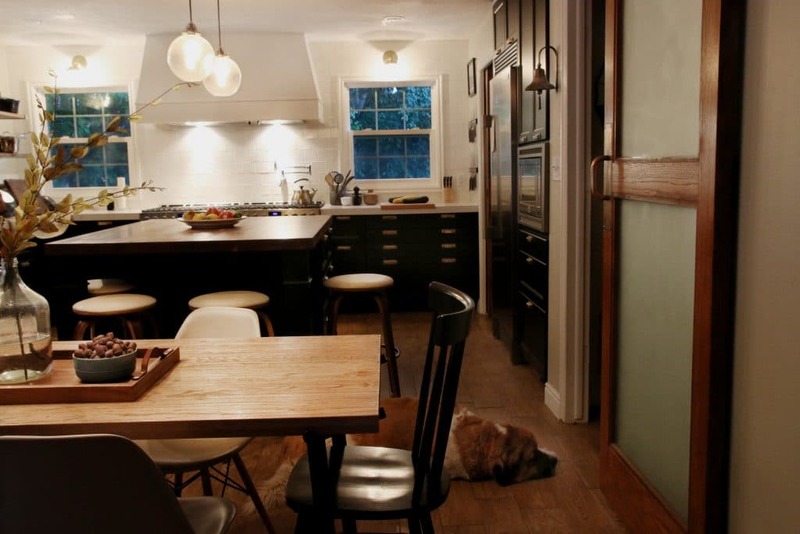 I would love to see window treatment options in the kitchen you would have used, if you needed them (future post?!). The new windows we got have UV protection built in–they are almost shaded! So while they don’t provide privacy protection, there is no direct view into our window from any of them. I’ve thought about putting up window treatments for aesthetics, but right now we’re loving the clean, open look. I know I’m late to this post but I’m hoping you see it and can answer my question: It looks like the window to the left of the stove got smaller? If so, how did that change your exterior siding? Want to do something similar but would have to re-do the whole wall of siding I think? Whenever we add a window somewhere else, we hold onto the leftover pieces of siding. We just used some of those leftover pieces to fill in the gaps. I’m rooting for the open shelving to stay! The current ones are centered and have a nice amount of breathing room around them. I’m wondering if you can update them to span the entire width of the walls, and maybe even fit 3 vertically? Hopefully you can find a solution for overflow dishes. I just picked up an antique oak cabinet for my dining room to keep my non-everyday dishes and cookware in. Is there anywhere you could fit a freestanding unit? Could they go in the pantry? My MIL has a short, heavy duty metal shelving unit from a restaurant supply store that she keeps extra dishes on to avoid blocking a window in her kitchen. Something like that could match the masculine vibe you have in your kitchen. Or have you seen the Variera dish stackers for drawers that Ikea sells? You might try Benjamin Moore Advance paint on the island. We used that to paint our kitchen cabinets and no chips! It’s really held up. I used BM Advance on my cabinets & they’re chipping. I think the Advance works better in lighter colours. I painted a dresser in majenta and chips all over it. I painted my cabinets in BM advanced paint in cloud white and they are chipping like crazy only 2 years later. I would never use it again. I missed the original post, but your kitchen is absolutely breathtaking! I love the open shelving – we’re thinking about doing that for our remodel too. We’ve still got a year or two to plan out, but thank you for the great inspiration!